In addition to my volunteer work teaching English at Diepsloot Combined School and managing a not-real travel agency called Time Pressure Tours, I have created another pseudo-business. I am now sole proprietor and instructor at my own faux driving school affectionately known (to me) as Schmool's Driving School. A majority of South Africans don't know how to drive. This is not a funny way of saying the people here are bad drivers, the way one might complain, "people in New Jersey can't drive," it's an actual fact. 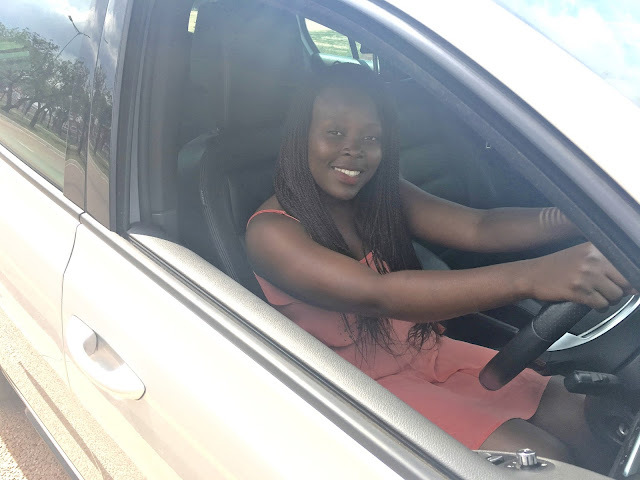 A report that I found online called the National Household Travel Survey 2013 indicated that as of 2013 only 48% of African males and 39% of African females in South Africa had driver's licenses. That leaves a majority who don't have licenses and who likely don't know how to drive. There are several reasons why a large percentage of people here can't drive and don't have licenses. First, many people have spent little to no time even riding in cars. Unlike a 16 year old in America, who maybe has never driven but who knows what a seat belt is and how it works, what the mirrors are for and how to adjust the seat, many people here do not have this basic knowledge. Combine this with the fact that driving school is expensive for a poor person (a quick check on Google shows five lessons cost R700) and it's hard to practice driving if you don't own a car and don't know anyone who does. Finally, if a person does manage to learn to drive, supposedly getting a license is notoriously difficult. There are many stories about corrupt agents who demand bribes in order issue licenses. I have only had two students attend my driving school. Confidence was first. I took her driving a few times. And then today, I had my second student, Clement. Clement works as a gardener for my friend Meghan. I have met him on numerous occasions when I've visited her house. Meghan told me months ago she had the idea of teaching Clement to drive and was thinking of doing so, but that her husband wouldn't go for it. Luckily, Mr. Deep doesn't have a problem with me teaching people to drive. That's because I don't tell him about it until after the fact. But rest assured, I teach people in a very un-busy parking lot so there is little risk or danger. On the subject of finding a suitable parking lot to conduct my lessons, it's actually quite difficult. Think about where you first learned to drive. Maybe you learned at a school or a church during a time when school or church was not in session and the parking lot was vacant. Meghan told me she learned to drive in a housing development that was under construction but where no one was living. All of these are great options if you don't live in Joburg. In Joburg, every parking lot of every school, mall, construction site, church or whatever is under the surveillance of a massive amount of security. Every school or church that I've ever seen is walled and gated with a security guard manning the gate. Every mall has numerous security guards patrolling the parking lots at all times. The same goes for construction sites. Luckily, I found a lot near my house that seemed a perfect location for Schmool's School to set up shop, a defunct shopping centre that only houses one business, a restaurant called Celestino's Pizza. 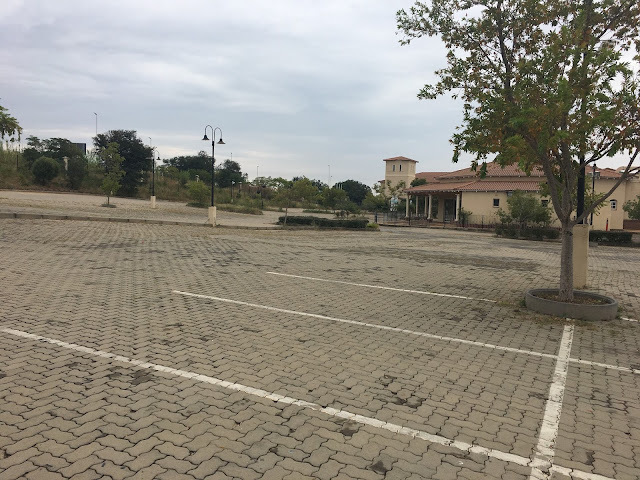 If you live in Joburg then you know this parking lot. If you don't, let me describe it for you. I am going to guess that about ten to fifteen years ago, this shopping centre, called The Fern was bustling. That was likely before ten additional modern shopping centres were built within five kilometres of The Fern. Even though there are tons of houses near the Fern and more being built all the time, The Fern is decrepit and the shopping centre looks like it's about to fall down. There may be more than one business functioning at The Fern, but the only one that I know of is Celestino's Pizza, a very nice place which has good pizza and food and even a nice atmosphere once you're inside. Even though Celestino's is good, it is not very busy at lunch and therefore this venue is perfect for daytime driving lessons. At least it was the last time I tried it. Wide open lot, perfect for driving lessons. Very little action at The Fern. Clement has patiently waited for months for his driving lesson as Meghan told him about it a while ago. When Meghan and Clement arrived at The Fern, I asked Clement if he had ever driven before and he said no. So I figured no information was too basic. I showed him how to adjust the seat and explained the mirrors and how to use them. I told him the difference between an automatic transmission and a manual (luckily Schmool is automatic.) I also shared the difference between the brake and the gas pedal and told him that only the right foot should be used, regardless of the pedal being depressed. After this brief but informative overview, we began the driving. I showed him how to start the ignition and put the car in gear and how to check the mirrors before pulling out of the parking space. Then, he drove us around the parking lot a few times. Clement was a great student, he quickly got the hang of the brakes, the gas and the steering. We had no near collisions. He was also extremely polite replying "yes ma'am" whenever I told him anything. I had just started preparing for the second part of the lesson, the part where he would pull into a parking space, park and then back out of the same space when we were approached by a security guard. Yes, even The Fern, which really has very little to protect, has a security guard. I proactively explained to the security guard that I was giving a driving lesson because I couldn't imagine that it would pose a problem. I thought he approached us because we were driving around, suspiciously, in circles. He told me that driving lessons were not allowed. He made it sound like a recurring problem, people teaching driving in the nearly abandoned Fern parking lot. Maybe it is an issue, given the lack of options. He then pointed a light pole, which was leaning quite heavily to one side and explained that another time, when someone was learning to drive in the lot, he or she crashed into that pole. I convinced him to allow us to continue our lesson for a few more minutes but that was the best I could do as there was really no way to hide our actions considering that there was nothing else going on in the lot to distract the guard. I felt badly for Clement that the lesson was cut short and so I asked he and Meghan if they wanted to have lunch. We went into Celestino's where a friendly waiter that I kind of know was working. I introduced him to Meghan and Clement and explained the driving lesson and told him what the security guard had said about the light post. He said that the light post had been hit by a motorist a long time ago and that it wasn't hit by someone learning to drive, but rather by a drunk guy. Even armed with this knowledge there was no way to continue the lesson so we ate our pizza and found out a little bit about Clement. Clement is 28 years old, actually he will officially turn 28 tomorrow He comes from Lesotho. He came to South Africa because there are very few jobs in Lesotho. His family has a farm where they grow maize, sorghum and pumpkins. He doesn't like the taste of sorghum beer but he does enjoy regular beer which Meghan gives him when she has some leftover after parties. On the family farm they also raise cows and donkeys. Clement has nothing against farming except that it's very unpredictable. If there is no rain or too much rain for example, it can become extremely difficult to survive. Clement prefers to have a steady income and earn a salary. Clement has a wife and five year old son named Tatalo. They live with Clement's parents, his two older sister's and one younger brother on the farm. Clement is the only family member who has left and come to work in South Africa. Clement's home in Lesotho, called Leribe, is four hours by bus from Joburg. The bus costs R250 each way. Meghan has told me that Clement very rarely goes home, as infrequently as once per year at Christmas. 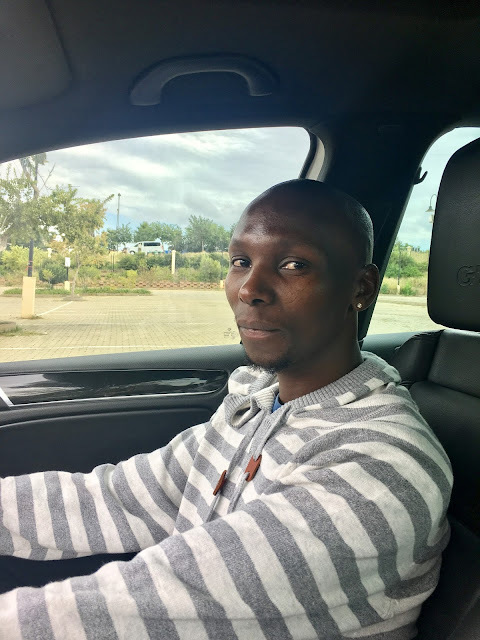 When Clement first came to South Africa, he got a job working construction for "Mr. Chris." Mr. Chris is Meghan's landlord and he also owns several other properties. Clement had never worked construction before and he learned on the job. He now not only works as Meghan's gardener, but he lives at a home that belongs to Mr. Chris, which is under construction, doing work like clearing trees and serving as security for the empty house. I asked him if the house he stays in, the one that is under construction, has electricity and and a kitchen and he said that it does, although Meghan said that there was a time when there was no electricity in the house. Clement speaks Sesotho, English and Zulu. 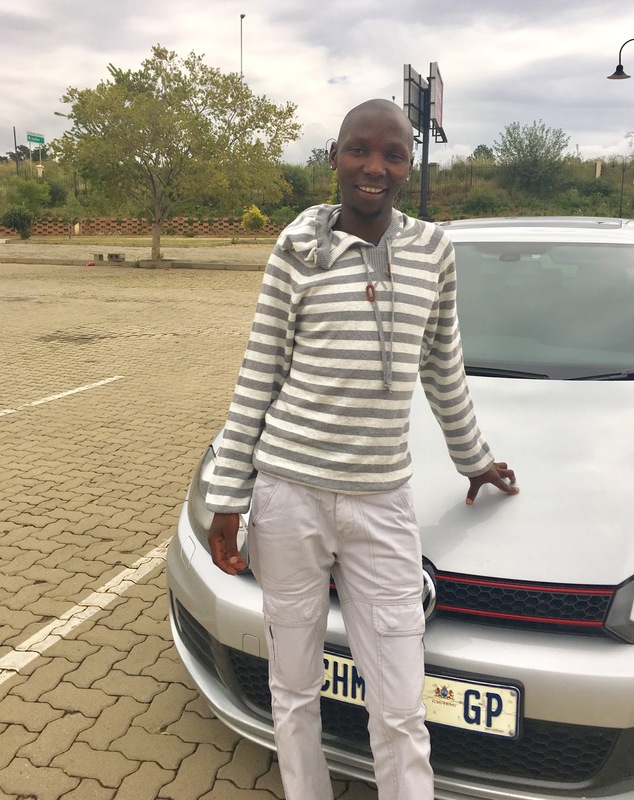 He learned English at school but did not learn Zulu until he came to South Africa. He told us Zulu is "easy" to learn. một số vết nám trên mặt có lớn chức năng là do sạm da. tăng sắc tố là một trong những sự thay đổi màu da thường, có màu nâu, đen hay xám xanh xám do sự sản xuất quá lớn sắc tố trên da. đốm nâu thường là kết quả của nội dụng phơi nắng và một số đổi thay nội tiết tố ở phái đẹp do progesterone và estrogen. nám thông thường được gọi là "Hỗn hợp đắp mặt mang thai nghén" vì do một vài mảng tối của nó - thường xây dựng trên mũi, xương gò má và hàm - thậm chí còn tăng mạnh hơn trong khi phái yếu mơ ước. Nhưng điều đó không có nghĩa là phái yếu chào đón sự phát triển của một vài điểm xấu hổ với cùng một loại thỏa lòng khi họ làm con mình. quyết định kem chống nắng mỗi ngày. bởi ánh sáng mặt trời là một trong những tác nhân đi đến mụn trứng cá nhiều nhất, việc tiến hàng kem chống nắng hàng ngày không thể thương lượng để giữ cho da bị khô. tìm kiếm kem chống nắng có bảo vệ rộng với SPF từ 30 trở lên. Nón bên cạnh đó trời. Mũ rộng rãi khiến giữ các phần dễ bị thương tổn trên mặt. chọn bóng râm khác cứ khi nào ngoài trời, là tốt. săn sóc da nhẹ nhàng. do những sản phẩm gây kích ứng da sẽ khiến trầm trọng thêm mức độ da bị sưng tấy, hãy tiến hàng một số sản phẩm nhẹ nhàng không bị đốt cũng có thể đốt.